The Edit Set Ease for Multiple Parameters dialog box lets you apply ease to multiple functions and keyframes. You can display the function curve and modify the Bezier or Ease curve—see About Velocity. Lets you type the percentage value corresponding to the length of time you want the easing to last. Stay between 0% and 100%. If you go beyond 100%, your motion will overshoot. Lets you type the percentage value of how strong you want the easing out to be. Stay between 0% and 100%. If you go beyond 100%, your motion will overshoot. Applies the easing parameters to the selected keyframes and then selects the previous keyframe in the timeline. 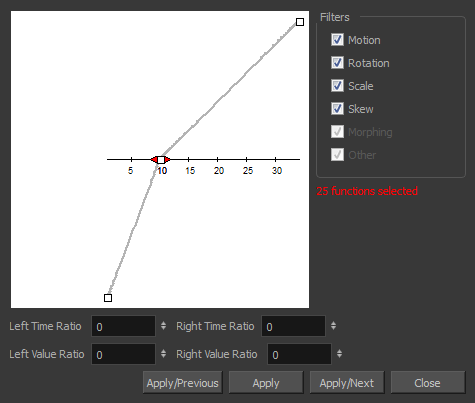 Applies the easing parameters to the selected keyframes. Applies the easing parameters to the selected keyframes and then selects the next keyframe in the timeline. Close the dialog box. If you did not apply the modifications, they will be cancelled.